“Mr. Reggie” hopes to continue working with children after he graduates from EMU. Photo by Jo Mathis. For students who need child care before and after school, child care assistants are among the first and last staffers of the day to make an impact. Principal Kathy Scarnecchia said that over the past two school years, Harris has unassumingly made an impact in the lives of his child care charges as well as other students. She says Harris is a role model for students, and that parents often tell her how much he means to their children. Vickie Malcolm, manager of Rec & Ed’s school age child care, says Harris is easy-going, upbeat and always has a huge smile on his face. Reginald Harris Jr. spent his early years in Ypsilanti, and moved to Ann Arbor when he started sixth grade at Scarlett Middle School. 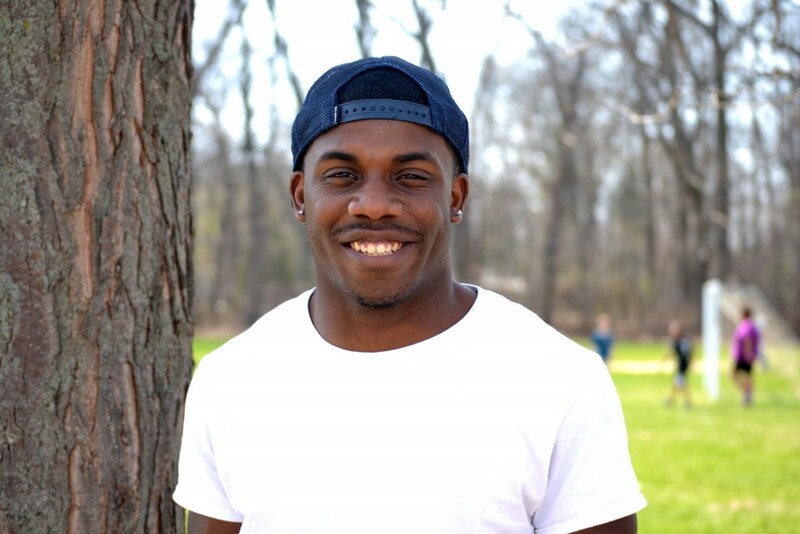 After graduating from Huron High School in 2012, he enrolled at Eastern Michigan University with a double major in psychology and communications. He’s worked as a Haisley paraprofessional before and after school for two years now, and his goal is to continue working with children in some aspect after graduation. “Working with the kids gives me great joy and pride, especially seeing that after two years, they are still happy and excited to see me every day,” he says. He is also an award-winning amateur boxer for EMU. Harris talked with AAPS District News Editor Jo Mathis about his work at Haisley. What have you learned about children that you didn’t know when you started the job? I have learned how much people impact kids’ lives. Before taking this position, I wasn’t aware of how big an impact teacher and paraprofessionals have on kids and how appreciative they are when they have someone they can relate to. What have you learned about parents? I’ve learned that parent are very protective people, and you have to earn their trust. Describe a typical day. For me, the day starts really early and goes really late. I start my day at Haisley at 7 a.m. and then go straight to the EMU campus for classes every day except Friday. After class, I have a couple hours to rest and study before I return to Haisley from 3 to 6 p.m. After work, I go immediately to the A2 Boxing gym for training until 8. From there, I go home to study, entertain or sleep. Is it hard to work a split shift every day? It is hard having a split shift, but I think because I’m a college student it works very well with my current lifestyle. I love being busy, and everything that I am doing needs to be done so I make sure I get it done. How do you know how to work with kids? My mom has always said that I am good with children and I really enjoy being around them. Also the training provided through AAPS is very helpful. Is it easier to work with students before school or after school? Before school may be a little calmer because it’s early and the energy level is a little lower. But after school is also nice. After sitting in class myself for hours, it’s nice to exert some physical energy along with the kids. Do you help with homework? Yes, I do help them with homework when they need it. I try not to give the answer, but go about it a different way. What’s the funniest thing a child has done or said? Just hearing the kids call me Mr. Reggie makes me smile everyday. I’m still not use to it. In the afternoon when I come in, I have at least five kids yelling, “Mr Reggie! Mr. Reggie!” They make me feel like a super hero. This comes as no surprise to me, Reggie’s aunt. He has always cared about kids and senior people. Will do anything he can to be helpful. Again no surprises he is a great person with a big heart! Love you nephew keep up the good work you are doing. Way to go Reggie, keep up the good work! Amazing young man with a great future ahead of him. Reggie — I was so glad to read this article about you and to know you’re doing well. I have great memories of you from Huron High and am excited to see you making your way in the world. I have no doubt that you are well loved at Haisley — what a lucky school to count you as one of their own! Love from Ms. Jones!